09/28/2016: I found out last night that my piece, Retrospective Loops, is in the top 100 (top 25 for my category) in public voting at Art Prize! I'm under no delusions that it will remain on the "leaderboard" for long (it changes by the hour and there are over 1,400 artists), but for the moment it's pretty cool that my work is connecting with people. 10/03/2016 Quick Update: Retrospective Loops did not make it to the next round, but it was very cool to watch thousands(!) of people interact and appreciate the piece! See the time lapse video below for a typical 90 minutes of Art Prize...and imagine that for 3 weeks. The Essay'd: 30 Artists book is beautiful! Much Appreciation to Steve Panton. Dennis Nawrocki, Matthew Piper and Sarah Rose Sharp for their insightful profiles and including my work with such esteemed company. My artwork is not always easy to capture, but Rosie's essay and Riva Sayegh's photos are outstanding! I was pleasantly surprised to learn that five paintings created by my Dad (James Hiram Malone) were recently discovered in the archives of the Detroit Children's Museum! According to Museum Curator, Don Bogart, they were displayed at the Detroit Children's Museum in 1969. I was very happy to see them again! Julia and Martin rang in 2016 by building a city from blocks and random toys. Here's a little video of their creation. 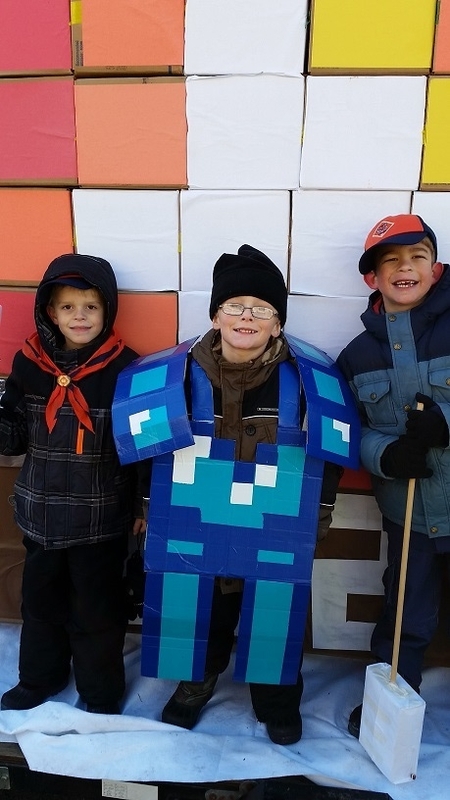 Cub Scout Pack 1627 made a sweet 11 ft high 8-bit Fire parade float (thanks to a generous donation of 70 boxes). 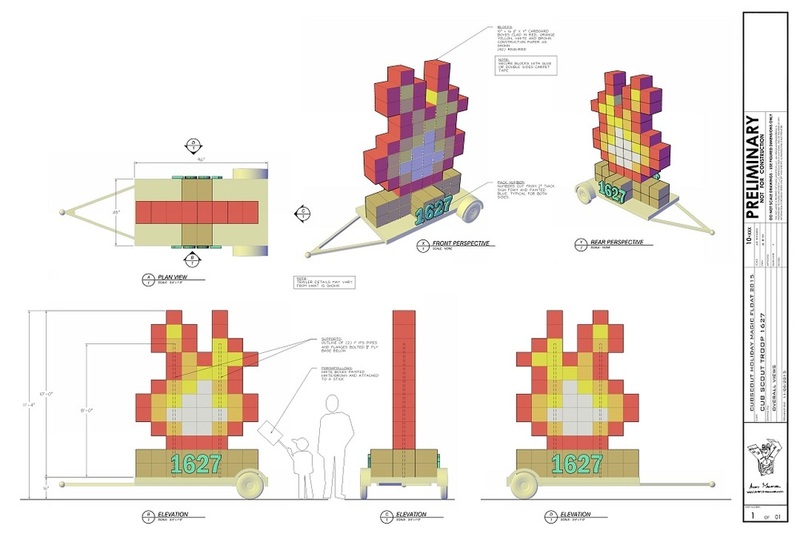 Each scout also had an 8-bit marshmallow to roast. It was probably best appreciated by folks familiar with Minecraft or video games from the 1980s. I'll be hanging around the Nora Culture Lab Pop-Up Shop on Wednesday November 11, 2015 from 5-7. Come and check out all of the great pieces created by local Detroit artists and designers. My extremely creative and resourceful friend Autumn asked me to help her build a Mermaid Dollhouse for her daughter Veronica's fourth birthday (which was a week away). Autumn based the design on a vintage clock she found online and gave me a cardboard mockup to work from. I built the wood frame and Autumn painted/decorated it just in time for Veronica's birthday. It was a very quick turnaround but worth it! My mutoscopes we part of a morning show segment (featuring Jane Schulak of Culture Lab Detroit and Liz Boone of Nora). Now my kids think I'm a big deal. Also, the opening was packed! Come see all of the work (in a less crowded setting) from now until November 15, 2015. Here are some "in progress" photos of the mutoscopes and composition pieces for the Nora Culture Lab Pop Up Store (opening on 10/30/2015). The store will feature Implosion, "Grandma Loves You" and "Not In My City..." as well as the Potholes composition. Art Prize 7 was equal parts inspiring and frustrating. I loved watching people take pains to understand and appreciate art, but seeing artists campaign and pander for votes was a little unsettling. I hate being the center of attention, so I let my Chess Set speak for itself. That said, the event is extremely professional and my venue (The BOB) was very accommodating. I received an amazing amount of exposure and some very valuable feedback on my work. 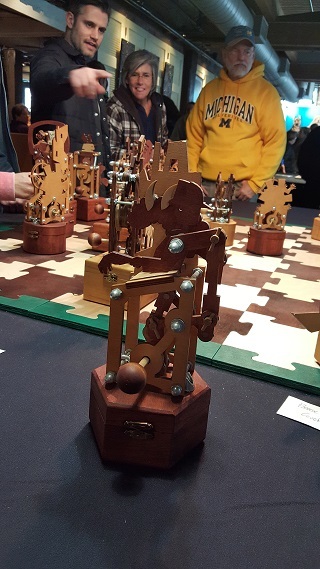 The ever insightful Rosie Sharp was kind enough to mention my Chess Set in her story for Hyperallergic! Read the article here. Hello! I just added a quick video of some of the mutoscope animations in the gallery. Check it out here. Also, if you find yourself in Grand Rapids this week, Art Prize voting is open until October 3, 2015. Last but not least, the Boggs Birdhouse are still on Display at Lafayette Greens.